Die EU-Innengrenzen sind dicht. Und trotzdem sind zehntausende Menschen auf europäischen Terrain weiterhin auf der Flucht. 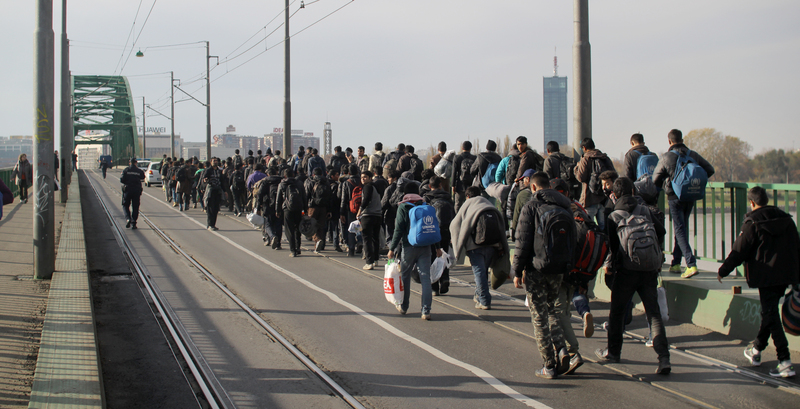 Insbesonderen in den Ländern entlang der „Balkanroute“ verschärft sich die Situation für Geflüchtete zusehends: Eine Weiterreise wird unmöglich, die Anerkennungsquote für Asylsuchende ist gering und staatliche Unterstützung gibts kaum bis gar nicht. Stattdessen gehören katastrophale Lebensbedingungen, Inhaftierung, Abschiebung und phyische Gewalt zum Alltag von Geflüchteten, die an den Grenzen oder Städten, wie Belgrad gestrandet sind. Und das öffentliche Interesse und die Anteilnahme für die Menschen, die dort unterwegs sind, wird immer geringer. Wenig Widerhall findet bisher auch der bereits dritte „March of hope“, zu dem es nach der Räumung eines von obdachlosen Geflüchteten besetzten Hauses gekommen ist. Die untenstehenden Eindrücke stammen von Menschen, die den Marsch begleiten. Today in the morning (3.30am until sunrise,5.50am )there was a big nightly police operation with huge police contingent (estimated 300 policemen, wearing helmets and shields, anti-terrorism-unit…) behind the main bus station in Belgrade, where more then 700 people on the move stay in empty warehouses. Finally they took 110 people into buses and brought them to the closed camp in Preševo near the Macedonian border, from where constantly people get pushed back. No violent acts by the attacked; police forces people to get into buses with telling lies and threats. After the big police operation two nights ago, when 250 police surrounded the warehouses – migrants squats behind the main bus station and more than 100 migrants were brought to detention center in Preševo people decided to organize another protest march this time towards the croation border. are following the march. commissariat stuff are also there. few people from solidarity groups is there to monitor but people have no serious support. People walked till late night and then tried to sleep under a bridge on the highway. yesterday they walked about 35km. It was raining the whole night, they are all wet ,people did not eat almost nothing. they continued walking today around 8 AM. the only place to get supplies was a petrol station which the police ordered to be closed for an hour. only one person was allowed to go in accompanied by police. Constant pressure from commissariat and UNHCR to end the march. 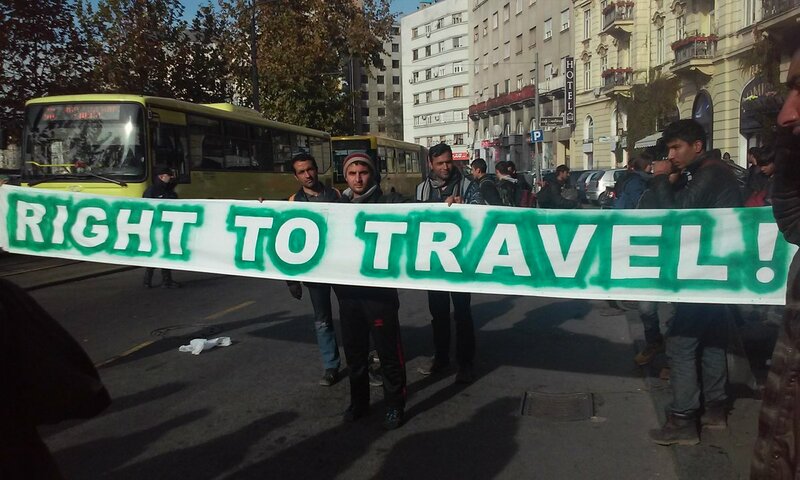 they were offered transportation back to Belgrade. People on the march refuse to negotiate with them. 9 police cars were there during the night, police was sleeping and cold so they stayed in their cars. it was possible to distribute some food and other supplies. seems there is a total ban, no NGO s have courage to show support. even HOt food Edomeni ( they cook about 1000 meals per day for people who stay in the warehouses behind the bus station) has no consensus to distribute food for people in the protest. of course there is lake of everything, mostly food, warm cloths and dry place where they could sleep at least few hours. unfortunately local solidarity groups have no capacities, only very few people try to do monitoring and other support. about 15 people could not continue to walk because of injuries. despite all the horrible conditions and big pressure people show unbelievable mental strength and determined to continue their protest.